In the 1950's and '60's Hamilton had a special division called the Awards Division. This group marketed watches to companies that wanted to provide service awards or watches for presentation. Most companies wanted watches that could not be found in your local jewelry store so recipients wouldn't find their award available for sale. To satisfy this need, Hamilton would sometimes use cases from obsolete models and outfit them with slightly different dials. Awards watches are an interesting niche in collecting. You can usually spot an awards watch because they are specially engraved on the back in a consistent manner, regardless of the company. Eventually awards watches got "masterpiece" on the dial too. So if you see a watch with "masterpiece" on the dial, it's almost certain to be an awards watch, even though it may look like a regular model too. A good example is the 1958 Courtney. The Courtney was produced for three years. 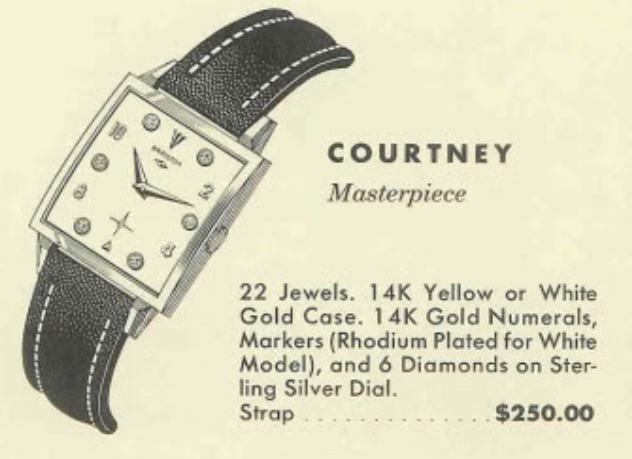 In 1959 the Courtney was also offered with a diamond dial. Even though it was part of the "masterpiece" line, it didn't have "masterpiece" written on the dial. So "masterpiece" written on the dial, is the clue that it's an awards watch. 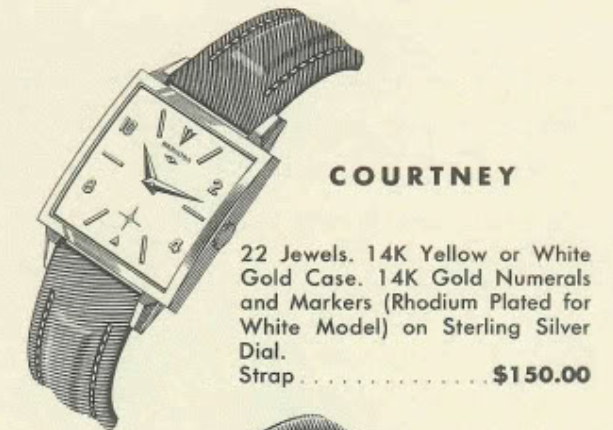 The Courtney came in a solid 14K gold case, in either white or yellow. The sterling silver dial had solid 14K gold numerals and markers. When it was offered in white gold, the markers were rhodium plated 14K gold so they looked white (silver). Inside the Courtney was the 12/0 sized 770 movement. As you might suspect from the title of this post, I recently received a Courtney, of sort. As you can see from the photo, it's got a different dial than you'd expect. There are no numerals, the 12 marker is different and there's no marker under the seconds register. It also says "WE" on the dial... which is certainly unusual. The case back is engraved with a presentation in classic Awards Division form and font from 1969 - 8 years after the Courtney was discontinued. WE is short of Western Electric and this watch recognized 40 years of service. The recipient started working for Western Electric in 1929... imagine that. A little googling revealed, best guess anyway, that the recipient was a lineman in the telephone industry and served in the Army during WWII as a warrant officer. Like the original Courtney, this watch also uses a 770 movement. This movement is interesting though. By the end of the 1960's, the 770 received a glucydur balance. This special type of balance design did not have any screws or weights attached. It was machine-balanced when it was originally manufactured. What's interesting is that Hamilton used this balance without changing the model number of the balance. Other grades, like the 730 and 735, became the 731 and 736 when they got the glucydur balance. This particular movement is rather hazy, so it's definitely due for a trip to the spa. Everything is completely disassembled before being cleaned and dried. Here's a close up of the glucydur balance. You can see how small sections of material were removed to poise the balance when it was originally assembled. The reassembled movement goes onto the timer and it's running just fine. The beat error is on the high side of acceptable. It's risky to adjust it with little to be gained by attempting so I'll leave it as is. I'll also leave it running a smidgen fast and recheck it after a while. There are two different height cannon pinion options for 770s, depending on style of the dial. Sometimes when the longer setup is called for, a spacer plate is used under the dial. The finished watch looks great, much better than my "after photo" makes it look out to be. The photo isn't bad but the watch is much nicer in person. Hello Dan, I'm new to your site and to collecting vintage watches. I was struck by your article on the Hamilton Courtney WE40 that you serviced so nicely and by the last name of the original award recipient of the watch. My interest is piqued by the name etched on the back as that is also my Mother's maiden name. Is this watch for sale? Thanks and I have learned so much from your site. I have the watch from this article and it is for sale. Please email if interested. I am the new owner of the 1958 Courtney WE40. I bought the watch with a custom band on it and I want to replace it with something close to factory. Do you know where I could find such a band? Hey Ralph, A lot of people like to find vintage straps for their watches and I think that's pretty cool as long as you don't want to wear them. That's for a couple of reasons... a) wearing them will ruin them and b) after 60+ years the leather tends to be stiff and crack easily. Why not just get a very nice and comfortable new strap in whatever color and material appeals to you? Unless it's a museum piece the watch deserves to be worn and enjoyed.